Well before the current incarnation, and even before his unfortunate association with a famous bad movie, Howard the Duck was… one of Marvel Comics’ strangest characters, created and written by Steve Gerber and illustrated by a parade of artists… perhaps most famously, Frank Brunner. 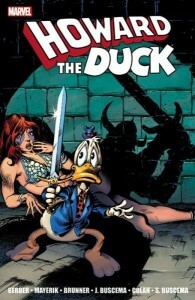 Well now this July Marvel is putting together a good part of the cosmic fowl’s early adventures in Howard the Duck: The Complete Collection. ” Howard the Duck takes an adventure into fear when he is plucked from Duckworld and finds himself on Earth, bill to proboscis with the melancholy muck-monster Man-Thing! Stuck here on a planet of hairless apes, the furious fowl forges a future for himself in, of all places, Cleveland. But the would-be Master of Quack-Fu will have his wings full hanging out with Spider-Man and waging ‘waaaugh’ with madcap menaces like the Space Turnip, the Cookie Creature, the Beaver and Doctor Bong. Will that earn him a spot on the Defenders?” We’ll soon find out! Other fine illustrators you’ll find in this more-than-400-page full-color trade paperback (and this is just Volume 1!) include Val Mayerik, John Buscema, Gene Colan, and Sal Buscema. Barnes & Noble has more.